The Scots are often considered to be a very martial race, though communities labelled as such often also attract labels much less complimentary. After the 'difficulties' of the Jacobite rebellions in the 18th century, by the time of the wars with Napoleon Scottish troops had a good reputation not only for excellence in battle but also for better discipline on and off the battlefield. Highland regiments participated in all the major campaigns of the British Army during the Napoleonic Wars, and also in North America, further cementing that reputation. This is the latest of many sets depicting these warriors, and here they are advancing at the point of the bayonet, an action they undertook many times over the years of war. As with many other Strelets sets, the bulk of the poses here are of one basic action with numerous small variations. In this case it is of men advancing with musket held forward and bayonet fitted, which is fine in itself and has generally been well done. 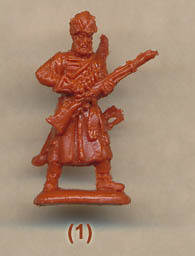 Those with musket upright are not as natural as those with it lowered to our eye, and almost no one has theirs as low as those on the box artwork. Also, every man has his left foot forward, so these men are presumably still in formation. Acceptable though those poses are, there is more interest in the six 'command' poses also included in the set. In our third row there are two pioneers, each carrying an unsheathed axe and moving forward. This is the first time such men have been modelled in this hobby, and both are reasonable poses. Of course the axe was a tool rather than a weapon (unless exceptional circumstances called for its offensive use), so these men are probably marching ahead of the men to break down obstructions. Next we have the almost obligatory piper, playing his pipes as he moves forward, followed by a sergeant carrying his spontoon. Both are fine poses too, but we were concerned by the ensign holding the flag. He has drawn his sword, so is only able to hold the staff with one hand - not an easy or comfortable thing to do at any time, especially when moving or if there is any wind. Generally he would only draw his sword if there was some apparent threat to the colours, so we found this pose fairly unlikely, quite awkward and not a good choice. Lastly we have an officer with sword neatly held upright against his body, so not waving it about to inspire or cajole his men as you generally find in figure sets. The uniform of kilted regiments changed little during the whole of the Wars, and has been well represented here. The men all wear the short jacket and of course the 'little kilt', plus stockings, gaiters and shoes. All have the usual bonnet with a fulsome display of black ostrich feathers as well as the hackle on the left side. This is what most people expect from Highland soldiers, and it is not wrong, though the rigours of campaigning usually meant the feathers in particular would quickly thin or disappear entirely, and the kilt often went the same way, frequently being replaced by trousers. So these represent something of an ideal, but then that is true of so many plastic figures and many customers are happy with that, so we have no complaints on the uniform. Well actually there is one, because even in ideal circumstances officers tended to wear trews or breeches in preference to the kilt, which was reserved for full dress. Equally the plaid scarf worn by the officer and the fly plaid of the ensign were more seen on the parade ground than the battlefield. It is not impossible to see officers with such items, so this is not a big problem, but we would have preferred to see unkilted officers as they would have been more typical. The two pioneers have a leather apron, which is good, as is the sash worn by the sergeant over his left shoulder in Highland fashion. The accoutrements of the Highland soldier were the same as for the rest of the infantry, and as with the uniform they have been mostly correctly done here. Each man has the cartridge box on his right hip suspended by a belt over the left shoulder. He also has a haversack, water bottle and bayonet on the left hip, all supported from belts over the right shoulder. No private has a sporran (they were full dress wear only), but the officer, ensign and piper do, which again suggests they are more for parade than action. All but the last two figures have a neat rectangular knapsack held by two straps with blanket or greatcoat rolled on top and mess tin attached. This dates the figures a little more precisely as this pattern first appeared in 1805, although it was many years before all had replaced the softer envelope-like predecessor. However here the sculptor has given every one external pockets to left and right, which is simply wasted effort as it is wrong. That apart the equipment is fine. Other than to observe that none of the privates wear the detachable peak on their bonnet (fine for certain regiments especially), and that everyone seems to have wings on the shoulders, indicating a flank company, there is nothing more to say about them, but the specialists require further comment. The two pioneers have the full kit, including the musket, and they have correctly been given the bill hook on the waist. However if you are spoiling us with two pioneer poses it would have been nice to see one carrying a saw, pickaxe or something other than the axe, since not all had an axe. These two lack a carrier for the axe anyway, but all pioneers did have full beards, so it is good to see these two are suitably unshaven. Pipers were unofficial during the Napoleonic period, but present nonetheless, and this one is pretty good, with his broadsword and correct arrangement of pipes. The sergeant has the proper three chevrons on his right upper sleeve, as well as his spontoon and sash to denote rank. He lacks the cartridge case (only the light companies carried a fusil), and has moved his equipment to the right side to make way for his broadsword. Uniquely in this set, and for no apparent reason, he has the peak on his bonnet. The clumsy ensign, as well as wearing full dress, holds a staff of a good length with a spear finial. The flag itself is about 10% smaller than it should be in both dimensions, though to be honest it is hard to notice and to us still looked good. It has no engraved design on either side, and is nicely sculpted to look natural. Sculpting is of the new very good Strelets style, so not much evidence of over-large components or detail, and generally good proportions. Hands are still an issue, often all but dissolving into the musket they are holding, so more attention needs to be paid there, but overall the detail is good and the style very pleasing. Oddly the musket of one of the pioneers is only partly done, which is presumably an oversight as the rest is much better. The choice of poses means there is no unwanted plastic, and there is no flash too, so full marks there. Our misgivings about this set are likely to be seen as trivial by many people. The fantasy pockets on the knapsacks can be trimmed off, and there are many who will welcome the parade-ground appearance of the officer and ensign, though this does somewhat contradict the 'in attack' of the title. 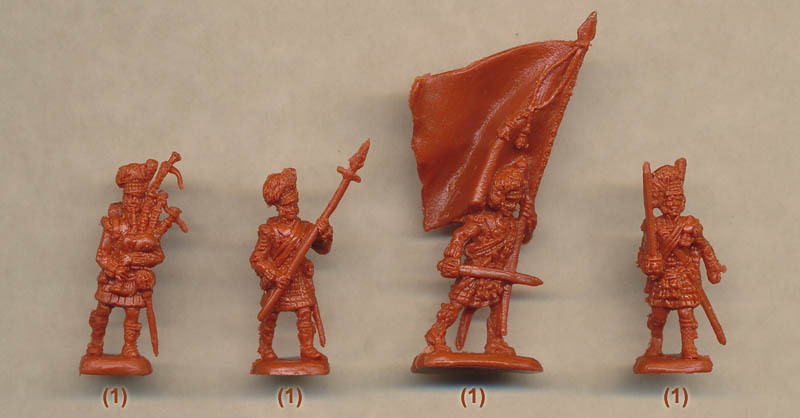 The ensign holding the flag with one hand is the only figure we would perhaps discard entirely, which leaves a large number of very useable and well-done figures which will look very well on the table-top or diorama base.